Luton vans are very big as you’ll see from the picture and dimensions. Our Luton’s specialise primarily in the objects that are very big or heavy. They are much taller than any of the other vans we have on our fleet therefore they can take a great deal more. Along with them being taller, they can also carry a lot more weight. We have a tail lift on the Luton’s to allow us to get every job you have into the van safely without damaging your item or the driver. This service can either be booked as a standard or priority. Standard will mean it may have other consignments on board therefore it may take a little longer to deliver. 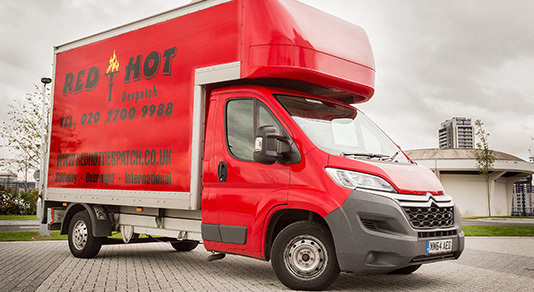 Priority means your consignment shall be the only parcel on board therefore it will go straight there with no stops on the way. Every job you book on this service is fully trackable through our online booking & tracking tool, to which you will receive a confirmation email on delivery.